In late 2014, David’s Bridal’s loss prevention team was reallocating internal resources and projects and felt that they needed to focus on improving their key management program. 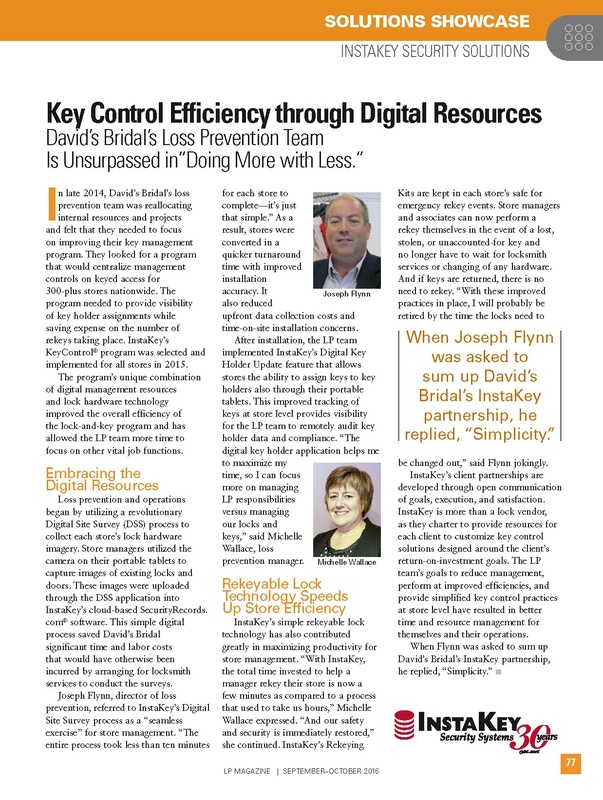 They looked for a program that would centralize management controls on keyed access for 300-plus stores nationwide. The program needed to provide visibility of key holder assignments while saving expense on the number of rekeys taking place. InstaKey’s KeyControl® program was selected and implemented for all stores in 2015. Loss prevention and operations began by utilizing a revolutionary Digital Site Survey (DSS) process to collect each store’s lock hardware imagery. Store managers utilized the camera on their portable tablets to capture images of existing locks and doors. These images were uploaded through the DSS application into InstaKey’s cloud-based SecurityRecords.com® software. This simple digital process saved David’s Bridal significant time and labor costs that would have otherwise been incurred by arranging for locksmith services to conduct the surveys.